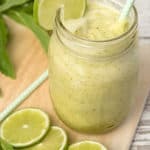 A delicious refreshing smoothie which tastes just like a Pine-Lime Splice. Place all the ingredients in the Thermomix. Blitz 10 sec/Speed 9. Repeat Blitz 10 sec/Speed 7. Add more coconut water for a thinner consistency.